This F2C Mini Basketball Hoop is the perfect way to practice your 3 pointers or free throws without committing to a full game on the court. Easily Set it up everywhere you want either in your bedroom, basement, playroom, or at the office. You can shoot hoops anytime of the day or night without to worry about bothering your neighbors, parents, or coworker with it's slight noise. It features an 23"x16"clear shatterproof backboard so do not worry it would break by regular shoots. The breakaway rim will snap down and back up as you jam, protecting your hands with every dunk. You can be sure that your fun will last. Go set it up and start shooting baskets in a matter of minutes.It's also a perfect gift for the basketball freak in your family, and makes a great addition to the home, office, or dorm room. 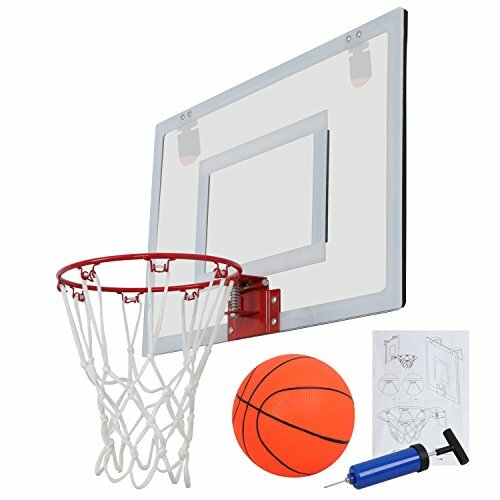 ★Simple to get the game started: Followed the paper manual included, this wall mounting basketball hoop set can be quickly set up with all necessary tools provided for mobile use. Get started to obtain the fun now! ★Shatter-proof backboard: The 23" x 16" backboard, made of clear shatter resistant polycarbonate. Specially added protective foam padding to minimum the damage to your wall/ door prevent scuffing that often occurs with other systems. ★The professional-grade basketball hoop with a 5.5" mini basketball, will give you the game-like action.With this set, you can get as close as possible to the real NBA experience, without having to leave your room. ★With a 9" diameter spring action "break-away" steel rim, you can practice your dunks anytime& anywhere. The spring will instantly bounce the rim back into place once you make the shot. ★Made for play with durable quality that would last long enough. Also a perfect addition to every basketball enthusiasts equipment collection. Designed for sports, fun or exercise at home, office, dorm or bedroom. You can also have fun playing this indoor basketball game with your friend or family.